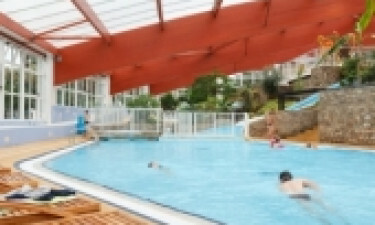 Located in the bay of Mont Saint-Michel in the Normandy region of France, Château Lez Eaux is a campers’ paradise and a member of the Les Castels chain of campsites. Boasting 12 acres of lush greenery and beautiful scenery, this peaceful and relaxing campsite has something for everyone to enjoy. Choose to stay in a fully-equipped mobile home or a luxurious apartment, both of which have modern appliances and air-conditioning systems. Book your camping holiday now with LUX-camp and take advantage of some fantastic deals and affordable prices. Why visit Château Lez Eaux? Beautiful onsite lake with fishing facilities. Picturesque views in the setting of a traditional manor house. Pool complex suitable for all the family. Beach and other beauty hotspots nearby. From tennis, football, fishing and cycling to sailing, Châteaux Lez Eaux has something to offer even those who are not so keen on sports. Located nearby are both a volleyball court and a small golf course and bikes can be hired on the campsite giving campers easy access to the many nature trails and cycle routes that are available. 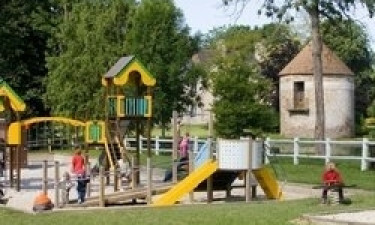 With tournaments and competitions regularly held on-site and a wonderful family atmosphere that is second to none, this fantastic campsite will keep both children and adults entertained all day long. For the children, this luxury camping complex has a games room with various arcade games, indoor and outdoor play areas and an action-packed 1300m² indoor waterpark with water slides, chutes and a separate pool for smaller children to splash about safely. For the adults, there is an on-site bar that provides holiday-makers with regular evening entertainment and live music concerts. For a change of scenery, venture out of the grounds and visit the stunning town of Mont Saint-Michel which is home to the world-renowned 14th century abbey. Alternatively, explore the Brittany coast or travel to Bayeaux which is only an hour away and boasts both a breathtaking cathedral and the famous Bayeaux Tapestry. 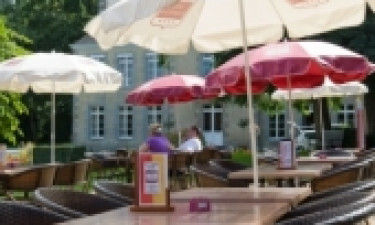 Château Lez Eaux campsite doesn't have a resident restaurant although it does provide a take-away service. Onsite, you'll find a small grocery store where you can stock up on the basics and anything else you need by way of camping essentials. With opportunities to purchase fresh bread, local produce and other basic groceries within the grounds of the campsite and both a large supermarket and a seasonal farmer’s market located only 5 minutes from the resort, campers can keep their cupboards fully stocked with ease.